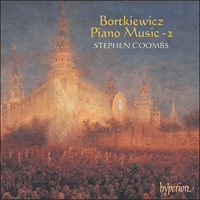 Since the release of Stephen Coombs' recording of the Piano Concerto No 1 (CDA66624) Bortkiewicz has become something of a cult composer amongst lovers of late romantic piano music. A man after his time, Bortkiewicz became all but forgotten after the First World War. He fled communist Russia to live first in Istanbul and then Vienna but his music remained resolutely that of pre-Revolution Moscow; like Rachmaninov in style but with even more 'tunes' and sentiment. This second disc of solo pieces (the first is CDA66933) includes some of Bortkiewicz's most imposing works. The Sonata Op 9 is his largest solo composition and the Ballade and Elegy are two of his finest. The disc is completed by two sets of character pieces that are typical of the bulk of his remaining piano output.